What is a Bench Scraper or Pastry Scraper? A bench scraper, which is also called a pastry scraper or dough scraper, is used in working with pastry, bread, and other doughs, It is a flat, rectangular piece of metal or plastic, often with a handle on the top. You may also see it called a bench knife, board scraper, dough cutter, or pastry scraper. True to its name, a bench scraper is used to scrape off dough that’s stuck to a work surface. It also is handy to use to cut the dough into portions with its edge. A bench scraper can also be used in cooking to push or scoop up ingredients off a cutting board or work surface into a bowl or pan, and can even be used to chop or crush soft foods. The blade of a bench scraper is usually made of steel but can be made from stiff plastic. It needs to be stiff enough for cutting. Testers at Cook's Illustrated said they preferred bench scrapers with thin, deeply beveled edges. They preferred a scraper that has a sharper edge rather than one with a dull edge. The grip can be made of rubber, nylon, metal, or plastic. Some models have a handle made of a curl of stainless steel, the same as the blade. A non-metal grip may be more comfortable to use. You can find scrapers with a larger-diameter grip that may be best for people with arthritis, although many cooks prefer one with a thinner grip that can be flatter to the work surface to use for scraping up the dough. Some bench scrapers have a ruler on the edge, making it easier to measure when cutting dough. Some models have a curved top so they can be used to scrape ingredients out of a bowl. Another variation is shaped like a dustbin, making it easier to scooping up diced ingredients. 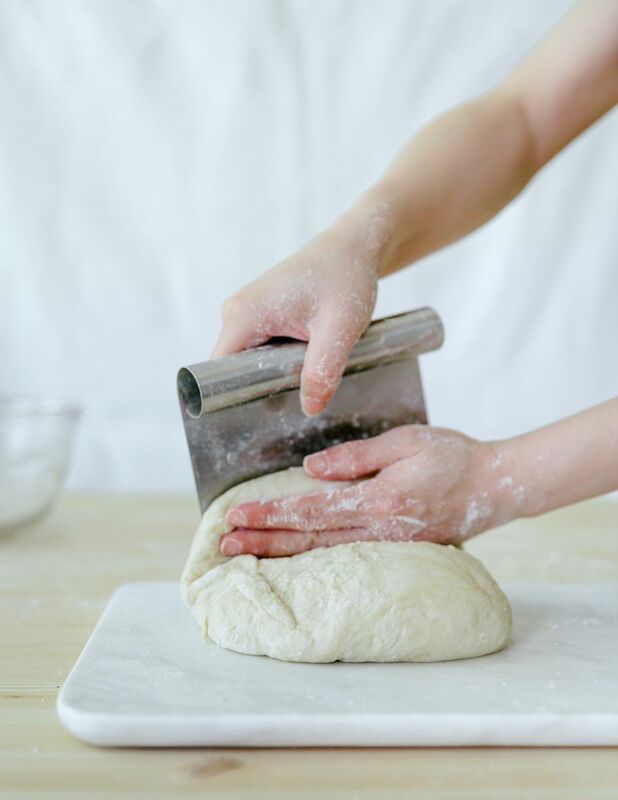 When you work with sticky dough, it can become quite messy as it sticks to the work surface, utensils, and your fingers. A bench scraper keeps your hands out of the dough while you can still manipulate it. You can use a bench scraper for the early stages of kneading a yeast dough when it is still prone to sticking to your hands. Cookie dough is another challenge, and you may want to use the scraper to work with it before you roll it out. After you've rolled out pie dough, a bench scraper is a perfect tool for lifting it from the work surface without tearing. A spatula or knife isn't wide enough to do the trick, while the wide blade of the scraper is excellent. The cutting edge of the bench scraper is useful for cutting the dough into portions for rolls, such as in this Cinnamon Roll Bread recipe. You can also use it for trimming pastry edges quickly.